We’re talking shore-power transformers with a boost feature to compensate for variations in dockside shore-power voltage, because two years ago Charles Industries, a major supplier to boat builders and yards, announced it was ceasing production of most of its Marine & Industrial products, including its IsoBoost. The reason was given on its website: “multiple factors, including: component availability, market demand, competing technologies, regulatory changes, and a corporate strategic shift away from printed circuit design and assembly.” This allows the company to devote more of its efforts to the telecommunications industry. All transformers described here are housed in square metal boxes. Atlas Marine Systems’ AutoShore 12-kVA unit weighs 190 lbs (86 kg). Note the emphasis on non-boosting. While the above features are valuable, many owners opt for the additional benefits of transformers that boost or increase voltage from shore-power sources when they are below nominal 115VAC or 240VAC. This can occur for a variety of reasons, including overloading by other boats on the same circuit at a dock, or dockside utility supplies that begin at 208VAC. Low voltage can damage certain sensitive equipment on board. Acme Electric, a Hubbell company, makes a wide variety of products, including the ubiquitous yellow shore-power cables and boosting isolation transformers. Its Auto Boost Isolation Transformer (ABIT) models are available for 50/60-Hz and 60-Hz frequencies, 1, 2, 5, 7.5, 15, and 25 kVA. Ward’s Marine of Fort Lauderdale, Florida, sells them for $562.79–$4,434.85. They are CE, CSA, and UL compliant, boosting voltage 10% when needed. The manual option can be WiFi-enabled for operating from a mobile device or computer. Voltages below 190V and above 250V disable the boost feature, though the boat’s electrical system is still isolated. Boost thresholds are 190V, 195V, 200V, 205V, 210V, 215V, and 220V. The remote-control unit and display can be mounted up to 25′ (7.6m) away or farther with an optional cable. 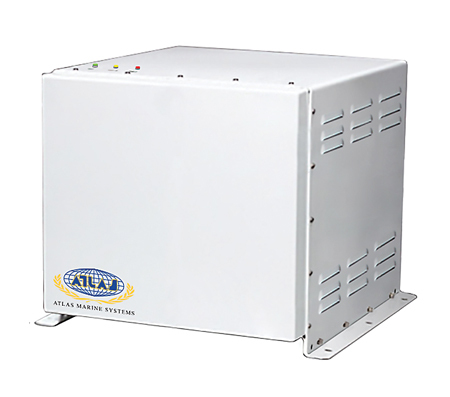 Atlas Marine Systems is a worldwide company offering a wide selection of onboard voltage-regulation and frequency converters. “Amid reports that Charles Industries had discontinued its IsoBoost product,” Atlas’s engineer, Nicholas Benvenutti, said, “Atlas received inquiries and feedback from customers describing improvements they would like to see in a replacement product.” The AutoSHORE power conditioner was already designed and in production for one of its large production-boat customers and deemed a more advanced replacement for Charles’s IsoBoost. The AutoSHORE is available in 12-kVA and 30-kVA models, which provide voltage regulation, voltage boost, surge protection, and electrical isolation from dock power. The output voltage is seamlessly regulated to ±3% even while in boost mode. These units are built with a compact and lightweight design (12 kVA: 190 lbs/86 kg, and 30 kVA: 358 lbs/162 kg) with internal fans to maintain a cool temperature. Frequencies: 45 Hz–66 Hz. The microprocessor controls continuously monitor dock voltage and automatically disconnect the output to protect the yacht if a large fall in voltage occurs. The 12-kVA unit utilizes the same dimensions and mounting-bolt pattern as the 50-amp Charles IsoBoost. Call for pricing. The Italian-made ANG-BOOST series of transformers accepts input shore voltage ranging from 178V to 255V in three operating thresholds. It is equipped with the Seamless transfer system to avoid power interruption during the switching, and adjusts output to at least 240V ±3V. Lower or higher input deactivates the boost feature, which can also be bypassed by the user, while maintaining isolation of the boat’s electrical system. As with other brands, a protective shield between primary (shore) and secondary (boat) windings assures isolation of the boat for electrical protection. There is also a soft start system to assure safe power during current inrush. The transformers can withstand 30% overload for at least one hour. Operating frequency is 50 Hz–60 Hz, useful for boats cruising in the U.S. and abroad. ANG-BOOST is provided with automatic restart from high voltage, low voltage, blackout, and overload. It is equipped with low peak transformers and an aluminum enclosure. Six models range from 12.5 kVA to 30 kVA with input current of 52A–125A. Prices: $6,200–$13,900. U.K.-based Energy Solutions offers a range of boosting isolation transformers that are ABYC and Lloyd’s compliant: 10-, 16-, 32-, 50-, 63-, and 100-amp single phase with output options for European boats and U.S. boats, as well as manual and automatic configuration. Acme Electric, N56 W13385 Silver Spring Dr., Menomonee Falls, WI 53051 USA, tel. 800–334–5214. A.N.G. Converters, 3200 S. Andrews Ave., Suite 207, Fort Lauderdale, FL 33316 USA, tel. 786–447–5273. Atlas Marine Systems, 1801 S. Perimeter Rd., Fort Lauderdale, FL 33309 USA, tel. 888–476–8687, 954–735–6767. Energy Solutions, 52-54 Riverside, Sir Thomas Longley Rd., Medway City Estate, Rochester, Kent ME2 4DP, U.K., tel. +44 1634 290772.